Capespan is defined by the quality of our fruit. So, we care for the people who nurture and produce it – our employees. To this end, Capespan funds the Capespan Blue Hand we care initiative. This non-profit public benefit organisation is dedicated to improving the quality of life of the people living and working on Capespan’s farms. In addition, Capespan supports local community projects by endorsing and sponsoring projects that are aligned with this mandate. The Blue Hand we care vision is to efficiently address primary health care, basic education and life-skills development needs, using integrated, sustainable initiatives that uplift beneficiaries and their communities. Projects include the installation of infrastructure, such as improved drinking water systems; and the renovation and construction of worker accommodation and facilities. 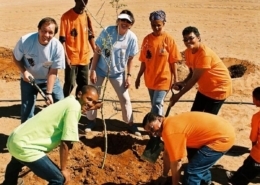 Capespan initiated the Capespan Foundation to develop a corporate social development programme. The Capespan Foundation focuses on adding value to the lives of needy communities in which the company operates by implementing various Blue Hand® social development, health and educational programmes. Each and every Capespan Blue Hand project has taught us values, social development lessons and inspired us. Year after year we’ve evolved our initiatives based on what we’ve learned to ensure a sustainable and measurable social development impact. As such, we’ll continue striving to improve the quality of life for all farm workers in Capespan operational areas: leading, mentoring and managing to aid empowerment, mental development and long-term career advancement. Because we believe that the job of everyone working on fruit production farms and in related industries, is more than a pay packet. It’s about knowledge, dignity and belonging to a self-respecting community. Northern Cape Our relationship with Northern Cape farms started when 2 000 trees were planted in an unforgiving landscape to green the farms. Limpopo Five schools in the Letsitele area received a major boost when Capespan Blue Hand donated containers of books, art, science and craft equipment received from partners UK School Aid, Capespan UK Ltd, Tilbury Container Services (now Forth Ports), Maersk Line, Harwood Shipping and Simpson Transport. 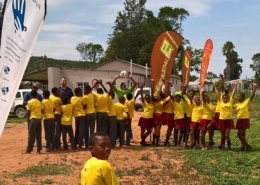 In addition, Mariveni, Mabundla and Seloane farms near Tzaneen were surprised with gifts of jackets and shirts for the trustees, 100 soccer balls and a basic library book collection for their community centre. 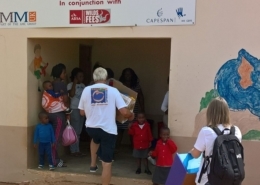 Mpumalanga Over the years pockets of Capespan Blue Hand initiatives in Mpumalanga started with stationery and T-shirt donations to senior learners at both Ben Viljoen Secondary School in Groblersdal and Ben Vorster High School in Tzaneen. Capespan Blue Hand also kicked off a vegetable garden project at Letaba School for the Disabled in Nkowankowa with a cash donation. The objective was to provide daily fresh produce for 210 physically disabled and cerebral palsied children of all ages. Eastern Cape Based near Addo in the Sundays River Valley, Thembalethu Trust cares for people living with HIV/AIDS, helping to give young children a better start in life and works with the youth to prevent future AIDS. In addition to staff donations and R1 000 corporate donation, Capespan followed this up with a R50 000 donation, a PC, printer and software, plus Capespan corporate wear. 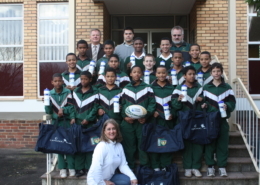 Namibia Commencing our involvement with the Namibia Grape Company (NGC), Capespan SA made a large donation of sport kit and equipment as an initial funding. 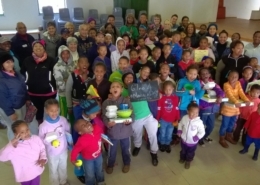 Western Cape Die Vallei Farm’s day-care centre in Villiersdorp received a generous lick of lead-free PVA paint from Capespan Blue Hand when Capespan staff jumped in to add educational content to the walls and blackboards. Into the bargain, the play area received a make-over with tractor tyres, a brightly painted outdoor play area and an obstacle course. Capespan’s Logistics Division used this event as a staff teambuilding exercise and also hosted a mini-Christmas party, which included a meal, snacks and a small gift for each child. Northern Cape We started small by improving basic amenities in day-care centres such as installing toilets, basins, ceilings, fences and lawns at play areas. Namibia In addition to its South-African activities, Capespan established the Namibia Grape Company Social Development Trust in partnership with the NGC. Western Cape Various Capespan farms and other exporter farms received the Blue Hand treatment in terms of needs such as facilities, educational supplies for pre-schools, annual internet fees and library resources. Among the beneficiaries were Grabouw-based Siphila Sonke Community Trust, Applethwaite farm in Grabouw, Achtertuin, De Keur and Rocklands farms in Ceres and Bo-Radyn and Queen Ann farms in Villiersdorp. Northern Cape We introduced Care Works to all farms to develop HIV/Aids awareness and health counselling for staff members while simultaneously training 22 representatives to operate as workplace HIV/Aids peer educators. We continued with on-going maintenance and developing after-care tutor service on Northern Cape farms during the year. Limpopo: Capespan Blue Hand distributed educational material and books donated by School Aid UK in the Letsitele area, fitted shelves at schools on Group 91 farms, Mahela and other schools in the rural areas. Eastern Cape We started supporting the Sisters of Mercy’s Place of Hope soup kitchen in Valencia with funding. Place of Hope serves meals twice a week to about 300 indigent Valencia residents, including the elderly and pre-school children. Meanwhile, we were also engaged in a Peer Educator advanced health training programme. Northern Cape Construction of cooking structures commenced on four farms followed by the same for a further six farms. The remainder of that year was spent on health education and training for peer educators, life skills and preventative hygiene, as well as health-care training for crèche staff, a voluntary HIV/Aids testing campaign and pre-school/créche educational toys and resources for 11 day-care centres. 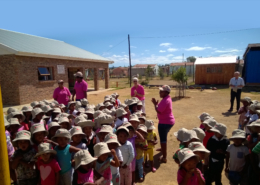 Mpumalanga Blue Hand funding assisted the Vorster farms, as well as renovations for a pre-school crèche near a Capespan-managed farm in the Komatipoort region. We also supplied the latter farm with educational equipment. Eastern Cape To ensure that school holidays were no longer an endless bore for local children, Capespan Blue Hand and the Thembalethu Trust hosted Youth Holiday Clubs, offering leisure and entertainment activities combined with educational life skills and food. That same year we assisted the Trust in upgrading the Nolukhanyo community crèche’s Grade R classroom and ablution facilities at Nomathamsanqa. Care Works supplemented the Thembalethu Trust’s work further by conducting HIV counselling and voluntary health screening campaigns to help and train workers from Capespan’s Penhill farm and five SRCC Farming Trust farms. Construction of pre-school facilities at Place of Hope was made possible by dint of a funding collaboration between Capespan Blue Hand and Hong Kong-based Metspan, in alliance with two local NGOs, Mercy Care and Marist Brothers, who started the Place of Hope Project some years ago. Both the pre-school and Community Health Care and Crafts Centre, which accommodate approximately 120 young children, positively impact more than 500 Valencia families. Collaborating with the AgriSeta, Capespan Blue Hand funded an ABET programme on Penhill Farm in 2012/13, followed by training labourers as peer educators in good health practices. 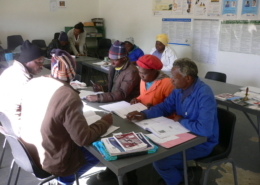 Western Cape To manage adult education and training more effectively, Capespan Blue Hand assisted a number of academically-deserving workers from Applethwaite and Queen Ann farms to acquire further levels in their ABET training during 2012-13. In helping to develop tomorrow’s leaders, we partnered with Symphonia’s leadership development programme, Partners for Possibility (P4P), to assist Western Cape government principals at schools with indigent learners. The programme enrolled more than 100 South African business leaders to work with school principals in a mutually-beneficial leadership development programme. Capespan joined in by enrolling six partnerships between 2012 and 2016. Northern Cape Two brand-new crèche facilities at Noudonsies and Arendsnes farms opened their doors to little feet thanks to our alliance with the Waitrose Foundation. To expand the Blue Hand health initiative, we built clinics on Arendsnes, Vrede and Noudonsies farms in 2012 and partnering with the Waitrose Foundation, we subsequently appointed a professional nurse to visit each of the clinics fortnightly. Limpopo Continuing our involvement with the Letaba School for the Disabled in Nkowankowa, we made an ad hoc contribution to the school from Capespan SA Golf Day proceeds. 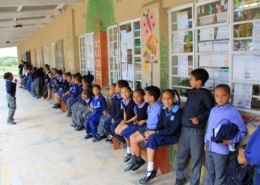 Western Cape This year saw the start of Capespan Blue Hand’s annual donations to Grabouw High School to ensure that quality educators are retained. During 2013-15, Capespan Blue Hand contributed generously to Thinking Schools South Africa’s cutting-edge programme to start developing critical thinking skills in the Western Cape’s school curriculum. We chose Bellville Primary School as initial beneficiary, because apart from having many indigent learners, it was located in Capespan head office’s municipal area. Mpumalanga About 150 Grade R/1 learners in the Komatipoort area were delighted to receive stationery and Blue Hand backpacks. 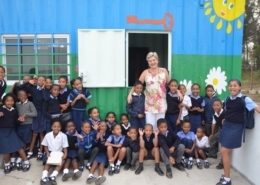 Western Cape Big Box Containers partnered with Capespan Blue Hand in 2014, providing a customised container for The Valley School in Durbanville to accommodate an extensive Early Childhood Literacy Development Programme, referred to as ‘Story Box’. It consists of Wordworks™ and Phonological Awareness intervention sessions with all learners from Grade R to grade 2, as well as mathematics and academic support tutoring sessions for Grade 4 to 6 learners. This container simultaneously serves as a hub training facility to support neighbouring schools with a similar programme. The Mandela Trust also has gifted a customised library container to the school, which is utilised and coordinated by Blue Hand Story Box volunteers. The Story Box project has expanded to such an extent that it has hosted community fundraising events for library books, coordinated shoe donations at a Kenridge Primary School for all 220 Valley School learners, extensions to the house of a disabled learner and more. Northern Cape Water is the source of life and thanks to Capespan Blue Hand’s three-year effort between 2014 and 2016, workers on all farms today enjoy crystal clear water from the new water purification systems. A few of these installations benefited from our association with the Waitrose Foundation. Eastern Cape Managed by professional nursing agency Incon Health, a partnered primary occupational health care service programme was launched in the Sundays River Valley on Penhill, three commercial farms and four SRCC community farms. Blue Hand facilitators also started presenting an introduction to the Wordworks™ Literacy Development programme to Place of Mercy staff. 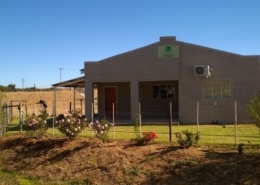 Northern Cape Three further clinics were built in 2015-16 on Oorkant Valam, Valam Omdraai and Noriseep where services are rendered in collaboration with the Northern Cape Health Department. Eastern Cape A three-day Blue Hand training initiative was attended by about 26 representatives from needy community crèches, as well as pre-schools coordinated by the Thembalethu and the SRCC Foundation Trusts in the Sundays River Valley. 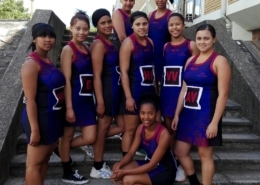 Western Cape We supplemented our involvement with Grabouw High School with a skills development programme for all 36 Grade 12 learners. Mpumalanga We continued our relationship with the Ben Viljoen Secondary School in Groblersdal by donating generously towards a learner’s new prosthetic leg. Eastern Cape The Masiphathisane crèche in the disadvantaged Moses Mabida township near Kirkwood in the Sundays River Valley received a ‘Camille Quine – Little Libraries’ donation, enabled by Capespan and Cool Fresh. The Wordworks™ Every Word Counts (EWC) training programme specifically targeted at training Community Works Programme workers, community healthcare home visitor volunteers, community library staff, as well as pre-school and crèche staff members living and working in the greater Sundays River Valley. Western Cape We extended the funding of a skills development programme for all Grade 12 learners at Grabouw High School to include the life skills development programme for Grade 10 and 11 learners. 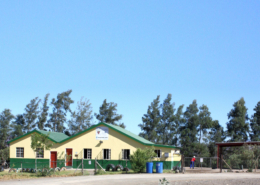 CSI at the Namibian Grapes Company includes the construction of a well-appointed pre-school which now employs two qualified teachers to benefit about 900 NGC farm workers and their immediate families; a fully-equipped 4×4 ambulance for the Aussenkehr community; and constructing ablution facilities, additional classrooms, a reception area, teachers’ lounge and principal office at the Aussenkehr Primary School. Kharras region’s elderly community members and a national sport event hosted by the Namibian Police Service. Over the years additional CSR projects ranged from secondary school bursaries, subsidies towards pre-school and day-care centre equipment and educational resources to a 65-seater bus and donating towards a residence for Aussenkehr Primary School staff members.